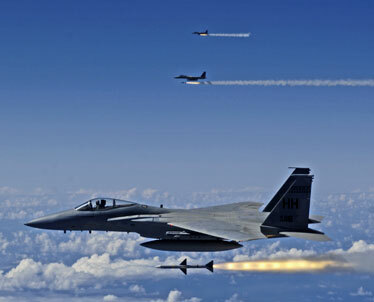 F-15 Eagles fired AIM-7 Sparrow missiles at a tactical decoy during Rim of the Pacific exercises off the coast of Hawaii The region's largest war games will take place again later this month and throughout July with air and naval forces from 10 countries participating. The state expects that the more than 20,400 military personnel - some of them bringing their spouses, friends and families to Hawaii - coming for next month's naval war games should pump nearly $26.4 million into Hawaii's economy. That's good news to a tourist industry reeling from the effect of the closure of two commercial airlines and rising airline prices because of increased fuel costs. Besides the United States., nine other countries - Australia, Canada, Chile, Japan, Netherlands, Peru, South Korea, United Kingdom and Singapore - are participating in this year's Rim of the Pacific, considered the largest naval war game in the Pacific. Two years ago, about 18,000 military personnel from eight countries participated in RIMPAC 2006 and spent an estimated $25 million. That was more than double the estimated $11 million spent by roughly 11,000 troops who took part in RIMPAC 2004, when the war on terrorism prompted countries to scale back their participation. The Pacific naval war games are held in Hawaiian waters every two years. This year it will begin June 29 and run though July 31. Of the 35 warships, 24 carry the U.S. flag with eight home-berthed at Pearl Harbor. They are two Aegis cruisers, USS Lake Erie and USS Port Royal; two destroyers, USS O'Kane and USS Paul Hamilton; one frigate, USS Reuben James; and three submarines, USS Key West, USS Los Angeles and USS Santa Fe. The Coast Guard cutter USS Rush from Sand Island also will participate. Besides the aircraft carrier the USS Kitty Hawk, which is stopping here on its way back to the West Coast to be decommissioned in January, two other larger warships participating are the 609-foot dock landing ship USS Comstock and the 844-foot helicopter assault carrier USS Bonhomme Richard. The Kitty Hawk, the Navy's oldest and last conventionally powered aircraft carrier, is 1,062 feet long and was first deployed in 1961. In the RIMPAC maneuvers, it will replace the carrier USS George Washington, damaged May 22 in a fire at sea. The 1,092-foot Washington is in San Diego for repairs. Initially, the two carriers were supposed to swap crews at Pearl Harbor since the Washington will replace the Kitty Hawk as the Navy's forward-deployed aircraft carrier in the Pacific, stationed at Yokosuka, Japan. About 2,700 sailors left Japan May 28 on the Kitty Hawk. Held since 1971, the RIMPAC exercise is the biggest multinational naval exercise in the Pacific. This years exercise, involving 10 nations, will fall under the command of Vice Adm. Samuel J. Locklear, commander of the San Diego-based 3rd Fleet. » Australia: one amphibious vessel, one frigate, one submarine and one support craft. » Japan: Four destroyers and three submarines. » South Korea: Two destroyers, and one submarine. The Pacific rim countries also are sending air force planes and crews to work with their counter parts at Hickam Air Force Base. The 13th Air Force will provide the Combined Forces Air Component commander who is Maj. Gen. Richard E. Perraut Jr.
Additionally, the Hawaii Air National Guard 199th Fighter Squadron will fly eight of its F-15 Eagles in the exercise. More than 300 U.S. and coalition personnel will use 613th Air and Space Operations Center facilities at Hickam to plan and execute daily flight operations. Additionally, the 15th Airlift Wing at Hickam will host aircraft from across the globe to include mainland-based based KC-135 air refueling tankers and an E-3 Airborne Warning and Control aircraft; US Navy MH-60 helicopters; Canadian CF-18 and CC-130 aircraft; and a Royal Air Force E-3.